July 2018 will be a very powerful month. First- some astrological aspects that last throughout the summer— Jupiter will go direct, helping us to expand outward into this world so make your effect a positive one. Jupiter will also help us out financially as it will expand our abundance in that sector! We have three eclipses—New Moon in Cancer on July 13, Full Moon in Aquarius on July 27, New Moon in Leo August 11. Eclipses magnify everything. These are going to magnify what is on our mind and thoughts and make us look at how and what we are thinking more so than deal with our emotions. Mercury goes retrograde (July 26th to August 19th). We tend to pull up a lot from the subconscious at this time and review, reflect and look at things in retrospect during Mercury Retrograde. We also have Mars Retrograde from June 26th to August 27th. With Mars Retrograde we will all feel low on energy and initiative. So we may be feeling inert, possibly even lazy during most of the summer- but hey, isn’t this a good time to lazy it up a bit? It may look like an inactive time but believe me, it is super active in the subconscious. There is a lot of shifting, clearing, processing and upgrading going on. It is kinda like sleep time… we look inactive but there is a lot going on and it is essential for our health and well being. This summer time will allow us to check in and see if we are heading in the right direction- our Soul Driven Direction. With so many planets in retrograde it will definitely be a “slow down time”– a time to process and integrate all that has happened since January (or maybe even since last September) or longer. There will be lots of quiet time, time for introspection, time to look at the past with fresh (higher awareness) eyes and perspective. It is an awesome time to do a life regression or other life regression (often known as past life regression). The eclipses are powerful yet subtle. They will give us a preview of what we can expect or where we might be in 2020. The Mars and Mercury Retrograde give us a chance to stop and catch up and figure things out- figure out our next moves. It will feel like two months of down time- like we are off the grid. The Mercury Retro time may bring mixed messages– not just from others but from our own intuitive self. Take no action until you are crystal clear. Watch for impulsivity. Best to pause before you speak and watch that you do not take any action from emotion. I will write more about this in the weekly energy alerts through out July and August. And of course I will expand on each months topic in the online spiritual community meetings on 7.2.18 and 8.6.18. You must be an online subscriber to join these. In numerology July is a “9” month of this 2 global year. This is a month where things come to an end. There is completion- we finish things up. It is a time to clean out, let go and release. For a lot of people, this month is where an old way of life completes and a new one begins. August is a “1” month and there will be new beginnings but the full effect or activation of these beginnings are not felt until September. Every ending gives way to a new beginning…..Whether you wanted and created this (like graduating from High school like my Gracie) or whether it was thrust upon you and out of your control or choice (like an illness or sudden death)… there will be endings and completions in July and new beginnings in August. July we process and complete the old ways so that a new way can emerge. Again, most of this will not be in action or outward changes, instead it will be inward in adjustments in attitudes, perspectives and feelings. The Angel Card Message I pulled for July is from the Doreen Virtue Healing With The Angels Oracle Cards–TRUST. Trust that all is in Divine Right Order even if it doesn’t look that way. Trust that you and everyone else has Guardian Angels, even when we don’t know it and they are always working and intervening on our behalf. 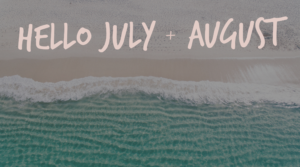 While July theme may be entitled PROCESSING–August theme should be PATIENCE. Oh no, I am not very good at that one. August is going to be a dreamy month. Most of whatever work or action we are doing will take place in our subconscious mind. Even though it is a “1”global month of new beginning, the beginnings may just be a new vision for yourself and your life. You may start to picture a new reality and new goals even if there is not action making them into form. Personally this is an important time to take stock of where you have been and where you want to go. It is a time where we will evaluate what is working and what isn’t. We will decide if what we used to want is still what we want. We have grown and evolved– even the ones who look like they haven’t- did, even if it was only an inch. Some of our old ways simply don’t fit with our vibration anymore. Most important, we are all having our personal “time’s up” moment where what we used to put up with or where we have been complacent no longer fits. We are asking, needing, wanting, creating upgrades to our personal lives that are more in alignment with ease, peace and joy. And who we meet or who shows up as helpers/partners to us is very important. It is a 2 global year where right partnerships, team work and group effort are the theme. We are not doing this life alone. By the end of August we will feel clear about a lot of things. The Angel Card Message I pulled for July is from the Doreen Virtue Healing With The Angels Oracle Cards–Archangel Michael. He reminds us he is with us now. He boosts our courage and releases us from our own fears. In the outer world we will undergo the classic involution-revolution-evolution process…. the collective consciousness is shifting. What used to work doesn’t and because of that shift a revolution of some kind will occur and this will lead to an evolution or elevation to that specific collective consciousness. Here is an example– We are watching this major drama unfold around families being separated at the border. The collective conscious of those pilgrims/pioneers/asylum seekers/refugees is shifting from one where there may be a collective painbody (throughout the history of time) of pain, suffering, oppression, threat, fear, injustice, family separation, torture, unfairness, inequality, prejudice etc… Think of all the historical time periods and events these themes have played out– and the different cultures that have endured this. Maybe in the past there was a helplessness to change this, maybe no other choice but to endure it but the collective outcry against it is now loud and being heard. The collective Spirit says NO MORE. What we see on the outside is an expression of the shift in consciousness in each of us personally and collectively that says– NO MORE to this. Involution- revolution-evolution = elevation! Remember that this may be playing out with these migrants now, but they represent ALL PEOPLE in any direction of time who have suffered such inhumane and unjust treatment and as we collectively renounce this situation, we change it, heal it, irradiate it from continuously repeating itself. We are clearing a collective painbody here. DO NOT re-energize it by connecting to the sorrow and suffering- that does not help- it just keeps it going. Stay emotionally clear and non judgmental to EVERYONE involved and remember that this is not who we are, not who we are supposed to be and this is not how we behave (and I am not just talking about Americans, I am taking about all human/divine beings and that means everyone in a body) This is not who we are, this is not how we behave, this is not what we came here to do or to experience. We un-create this by remembering — and remember it for those who are asleep and can’t. Tele-communicate this to others- to those who are suffering, to those who look like they are the cause of the suffering. Let’s break this cycle and end this painbody once and for all. Give no power to the dark or dense, stay focused on light, ground to that, hold that for yourself and for others. Rise above your human reaction to this and hold the space of peace. This is our purpose now. I know, we have been given a challenging task here. We can do this. Again, look for my weekly energy alerts in your Monday email, I will keep reminding you to REMEMBER and to hold the space. So I guess I will see you in September. Thank you for this and especially for the tools to manage the emotions/fears/concerns for the separated families. This is not who we are is my new mantra to stay out of judgment and in a positive place – for healing! Holy crap, Ro! Awesome Energy Alert! I could feel your spit-fire energy as you talked about the involution-revolution-evolution process! It has made me see things in a new perspective. You’re the best! What a beautiful message, so eloquently spoken and inspiring . I hope I can hold it in my heart, remember that I’m not alone, then I can prosper! G- so good to hear from you. I am/was in cape may same time as you. super haunted!! Hope you managed with the energy. It is one of my favorite places to be. Miss you and will see you soon. Ro, this was a wonderful energy alert and I shared this with my daughter Hanna. Also, I hope to see you in LBI next Wed! My family is down next week and so happy it coincides with your summer schedule at the library. Hope to see you Aug 8th and peace and love to you and yours!